ProCamera is a well-balanced 5-in-1 app that enhances still photo and video, and includes a suite of photo editing tools, social networking support, and camera related utilities. 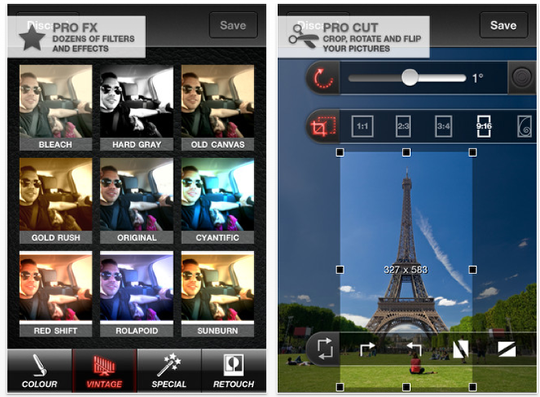 ProCamera sets the standard as the most professional camera app with its high-end features. Beautiful and intuitive design makes ProCamera very easy to use. This app has just been updated, check out the new features below. This is a free update but if you haven’t already downloaded this app you can do so here. It retails for $1.99/£1.49/download. Scan QR, DataMatrix and EAN codes and get context sensitive options to use them quickly. Record videos with high quality zoom. (Zoom is applied after the video has been recorded to ensure maximum video quality with 25fps). Upload your photos to DropBox – and if you want – simultaneously to Flickr, Facebook and Twitter. ProCamera’s interface now has a new fresh look! Inspect taken photos in detail before you save them. Now with 8x zoom. Energy saving mode for longer battery life. Completely rewritten and restructured settings. Add your copyright information to the metadata of all photos (EXIF) and videos. Visual Timestamp (in addition to the non-visible EXIF data).